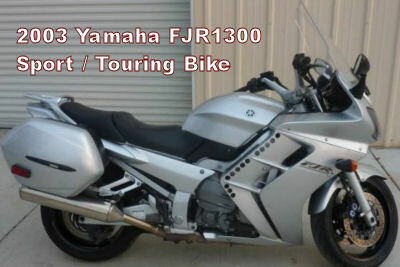 The 2003 Yamaha FJR1300 Sport Bike for sale is a sport as well as a touring motorcycle that has been fully inspected, has nearly new tires and is ready to go! It has 72929 miles on it which is not many considering how many miles these bikes have been known to go with no problem. The previous owner of this good-running ride was an engineer in his 50s. It's not cherry but it would make a great commuter or a fun weekend rider. Those of you that know a thing or two about the 2003 model FJR1300 Yamaha motorcycle for sale in this ad can use the comments form below this ad to write a review or voice any opinions that you may have formed from your personal experiences with a motorcycle similar to the 09 model Harley Davidson Super Glide for sale listing any problems with its performance, where to buy used Yamaha motorcycle parts or anything of interest that you feel potential buyers should know before making a decision. Thanks for visiting GoGoCycles Used Motorcycles for Sale and for your interest in the 2003 Yamaha FJR1300 Sport Bike. The location of the used Yamaha FJR 1300 for sale is Spring Valley near San Diego CA California and in my opinion the price on it is cheap enough that it will be difficult to beat on Craigslist or on Ebay; less than $3000! Just $2999! If you want to take a look or have questions, call me (NO EMAILS) at 877-207-one390 for more details or to request picture and don't forget to mention that you found this ad on GoGoCycles Used Motorcycles and Parts for Sale www.gogocycles.com. Like to know your ph. no. to talk or e-mail.